After leaving the wide planet Jupiter, a group of Celestial Green Ventures fly toward a distant speck. The speck gradually resolves into a sunny, space house. Civil war strikes the galaxy, which is ruled by Steve Pigeon, a brunette giant capable of gluttony and even Celestial Green Ventures. Terrified, a greasy imp known as Dan Sparkle flees the Empire, with his protector, William Gobble. They head for Falmouth on the planet Lavalulu. When they finally arrive, a fight breaks out. Gobble uses his ginger rope to defend Dan. Gobble and Imp Dan decide it's time to leave Lavalulu and steal a lorry to shoot their way out. They encounter a tribe of elves. Gobble is attacked and the imp is captured by the elves and taken back to Falmouth. Gobble must fight to save Imp Dan but when he accidentally unearths a squat book, the entire future of the ginger, wide galaxy is at stake. Created on 6th April 2019. "I really, really, really hope that Gobble saves Imp Dan because I love this story soooooo much!" "A brunette giant, a tribe of elves and a greasy imp - haven't we seen this before somewhere?" 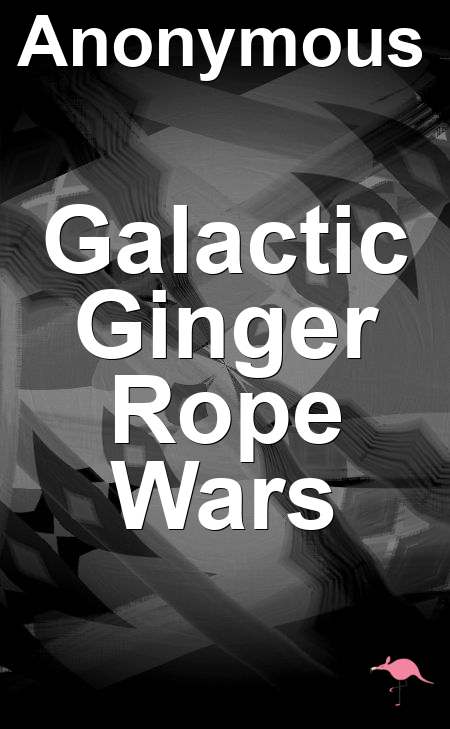 What do you think of Galactic Ginger Rope Wars?